Facebook’s true value resides in its 2.1 billion users, and investors need to worry about what happens if enough of them decide that free social media isn’t worth the cost. First, a disclosure: I’ve never used Facebook. I get that it’s an awesome way to keep in touch with family and friends, meet new people and get a personalized online experience. But I value my privacy, and it’s hard to reconcile that with the fact that Facebook is in the business of selling its users’ information. And it’s a great business. Facebook generated earnings from continuing operations of $15.9 billion in 2017 on revenue of $40.7 billion, 98 percent of which came from advertising. If it isn’t already obvious that Facebook is a money-making dynamo, consider how it stacks up with digital ad rival Alphabet Inc., the parent of Google. Facebook’s gross margin was 87 percent last year, and its net income margin was 39 percent. That compares with 59 percent and 11 percent, respectively, for Alphabet. One obvious takeaway from those numbers is that Facebook’s users’ information is hugely valuable. 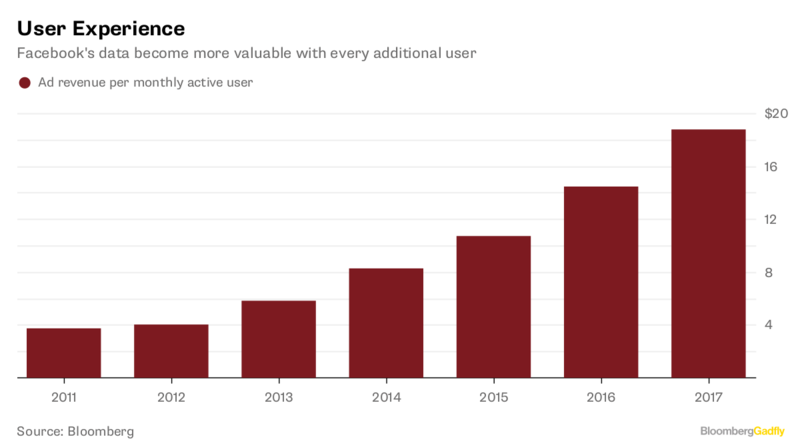 Less obvious is that the value of Facebook’s data trove grows exponentially with additional users. Facebook generated $3.2 billion of ad revenue in 2011 with 845 million monthly active users, or $3.79 for each one. In 2017, Facebook scooped up $40 billion of ad revenue with 2.1 billion users, or $19.05 for each one. As Facebook grows, in other words, so does the appetite for its data. It was only a matter of time before that data was wielded in ways that Facebook’s users disliked. I suspect that the Cambridge Analytica debacle is just the first of many revelations to come. Regulators and investors are troubled. The Federal Trade Commission announced on Monday that it is investigating Facebook’s privacy practices, and the company’ shares continued to slump in an otherwise advancing market, down more than 5 percent. points out that Facebook could address those concerns by selling subscriptions rather than ads. I, for one, would be more likely to join if Facebook committed to protecting users’ information for a fee. But don’t expect Facebook subscriptions any time soon. For one, it’s not easy to sell subscriptions. Just ask newspapers. Or Amazon and Netflix. Despite their success, the combined number of Amazon Prime and Netflix subscribers is roughly one-tenth the number of Facebook’s users. More important, selling subscriptions won’t deliver the exponential revenue growth per user that Facebook now enjoys from selling ads. As long as maximizing profits is Facebook’s chief priority, its interests will be difficult to reconcile with those of its users. The question for Facebook’s investors is how many of the company’s users will decide that their privacy is more important. The longer-term danger is clear: If enough users clamor for a subscription-based alternative, enterprising competitors will eventually give them what they want. The near-term risk is just as sobering, however. 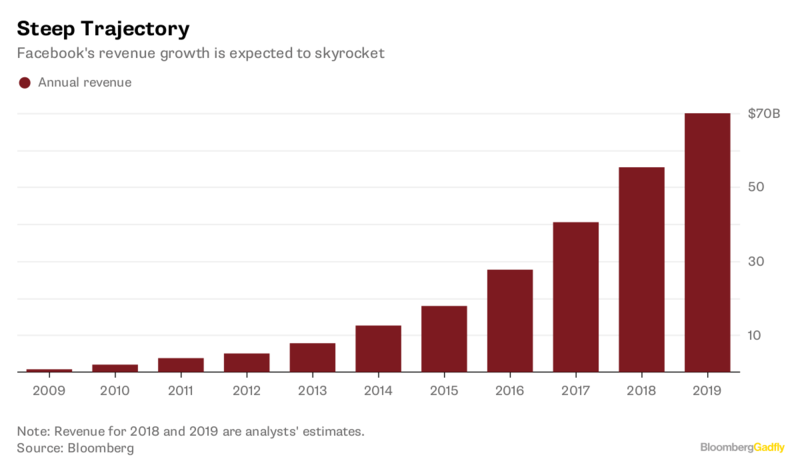 Facebook is expected to generate $70 billion in revenue in 2019, according to analysts’ estimates compiled by Bloomberg. That translates into a reasonable price-to-earnings ratio of 15.5, or just slightly higher than the S&P 500 Index’s P/E ratio of 15 based on earnings estimates for 2019. But the flip side of Facebook’s growth model is that its fortunes could turn just as quickly. If Facebook’s historical financials are any guide, a mere 13 percent decline in the number of users — which would leave it with the same number it had at the end of 2016 — would translate into a 23 percent decline in ad revenue per user and a 33 percent decline in revenue. Earnings, in turn, would drop by 43 percent and its P/E ratio would spike to 45. If that were to happen, Facebook’s stock would have to decline by 65 percent to reach that reasonable P/E ratio of 15.5. 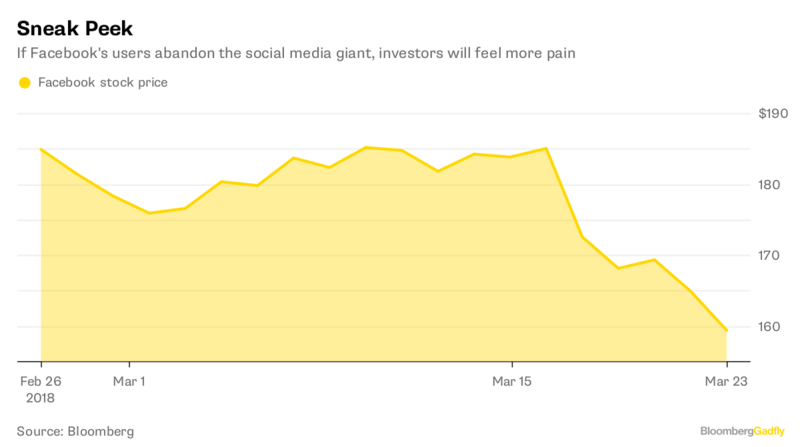 It would take more than a few defections to bring down Facebook, but investors should bear in mind that the same isn’t necessarily true of its stock.